Dwayne Evans went a ridiculous 16 for 20 from the charity stripe against ISU. ST. LOUIS — Now that was a bounce-back game. After not making a field goal and scoring only four points his last time out, Saint Louis University forward Dwayne Evans went for a season-high 24 points Wednesday night. And, as is usually the case, when your best player is on, things tend to go better for everyone. As in SLU 83, Indiana State 66 in a performance that Evans called the 10-2 Billikens’ best of the season. Though you’re not likely to see the Sycamores (7-3) in anyone’s Top 25, they came in averaging 80 points with a victory at then-ranked Notre Dame on their resume. "A great win, obviously the best win of the year," Evans said. "We played well throughout the entire game. Everyone played well." No Billiken played better than their leader and leading scorer. Evans took only eight shots, making four, but he more than made up for a lack of field-goal attempts by hitting 16 of 20 free throws. Indiana State proved unable to keep him from gaining the position he wanted on the low block without wrapping him up or holding him. A lot. Largely because of Indiana State’s unsuccessful attempts to deny Evans, SLU reached the bonus barely six minutes into the second half. The more Sycamores coach Greg Lansing shouted at his inside defenders to deny Evans, the more fouls his players accumulated. Evans topped his career-best in free-throw attempts by six. "After so many, I kind of got tired," Evans said, quickly adding, "I’m kidding. I’m kidding." Like any top player, Evans said he felt an extra bounce in his step for Indiana State after Saturday’s clunker against Wofford, which ended a 28-game streak of scoring in double figures. "It’s natural to feel more motivated, especially since I know I can play a lot better than I showed," he said. But showing the wisdom of a four-year starter, he did not come out firing away in an attempt to get back the points he didn’t score the other day. "I didn’t want to try to do too much to make up for a bad performance," he said. Evans didn’t score his first points until the game was nearly nine minutes old, when his 12-footer from the right corner gave SLU a 17-9 lead. He soon followed with his first two free throws and a layup before being given a breather. He didn’t get much of a chance to breathe, though. The Sycamores took advantage of his absence by scoring eight points in barely more than a minute. Timeout, SLU. Re-enter Evans, who promptly was fed the ball inside and got fouled. He missed his first attempt but made the second to get SLU going again. Indiana State hung tough until late in the half, which ended with 6-11 Rob Loe hitting a 3-pointer from the top of the key for a 34-27 lead. Besides Evans’ free-throw barrage (11 for 14) in the second half, the Billikens also found a shooting touch that has been missing much of the season. For that, they also can thank Evans. The shooters were able to get good looks from the outside because Evans was attracting so much attention inside. The Billikens made Indiana State pay by hitting 6 of 10 3-pointers and running up 49 points in the second half after they missed 11 of 15 3’s in the first half. "In the first half, we weren’t hitting shots but they were the right shots," SLU coach Jim Crews said. "We really tried to encourage them. Those are the right shots. Keep taking the shots and fortunately those guys really knocked some good shots in." 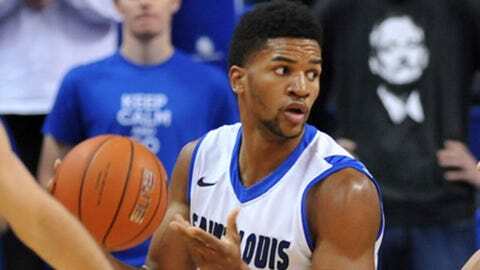 What was even better for the Billikens: "Our guys did a good job of finding Dwayne. He got to the line a lot, so that was good." Certainly far finer than Saturday, for Evans and his team.